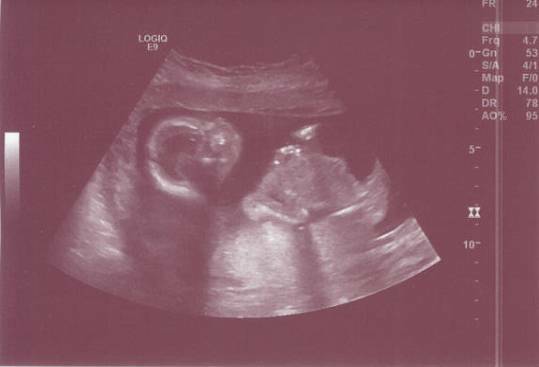 Today I am 21 weeks and 2 days into my second pregnancy. Our first son, Matthew (who continues to live up to the meaning behind his name on a daily basis "Gift of God") was born a healthy 8 pounds, 12 ounces and just celebrated his first birthday 12 days ago on August 19th. Five days before his first birthday party, my OB doctor called to let me know that although my "Quad-Marker" screening results came back negative at 12 weeks gestation for Down Syndrome (DS), the follow up results at 18 weeks came back abnormal with a 1/85 risk for Trisomy 21, which is more commonly known as DS (normal results for a mom my age - 30, are 1/650). She suggested that I follow up later in the week with a "high risk" doctor who routinely travels from Cleveland Clinic's Hillcrest Campus to work with high risk pregnancies in my area. 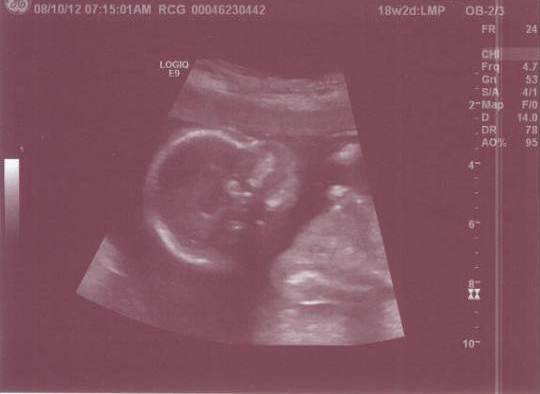 We scheduled that appointment, a Level II Ultrasound for Wednesday, just a few days later. During that appointment, just two days before Matthew's birthday party, we learned that the high risk doctor suspected our second child had Complete Atrioventricular Canal Defect or CAVC for short as well as Down Syndrome or DS. Apparently CAVC is present in about 50% of babies with DS and considering that our Level II Ultrasound showed a 6 MM thickness behind baby's neck combined with me having the "abnormal" blood work results at 18 weeks, all of the "facts" were pointing in that direction. That evening, my regular OB doctor called me from her home to check in on me... She is so compassionate and wonderful and I have been very fortunate to have her as my doctor. During our conversation she wanted to know if we had any questions and in general, it was so comforting to speak with her during an evening when I felt so confused and upset. The next morning I worked from home and called my boss to share with her what had happened the day before. Looking back, it probably wasn't fair of me to call her... she was only the fourth person I had shared the news with behind my mom, my husband and our doctor and because of that, I believe she may have received a very emotional and admittedly, my worst delivery - fortunately, I don't think she held it against me! She was so kind and told me to take the day off, which after a few short hours of completing something that needed done, I did... which was wonderful since all week during the evenings, I had spent most of the week researching "What is DS? ", "Level II Ultrasound", What is CAVC? ", etc. instead of preparing for Matthew's 1st Birthday party, which was scheduled for the next day. My mom ended up taking a vacation day from work (after I called her at 7:30 AM sobbing) and she spent the day with Matthew and I running errands for the party (which turned out really wonderful, if I must say so myself). I can recall 3 instances on that Friday when I lost total control of my emotions and truly wept. Looking back I am [almost] humored as I think of times when I was listening to myself cry and though to myself, "did that sound just come out of my throat?" It was the first time in my life that I've every truly sobbed out of helplessness, fear, hurt and disappointment. I mean, I had already conceived, carried and delivered a healthy child, how could this be happening to me? My eyes burned for two days afterwards. My mother cut up fruit and made vegetable trays for the party and helped me to stay on task that evening, even staying at our house until 11:30 PM when we finally finished the centerpieces, mason jars filled with rice that held doubled sided signs with pictures from Matthew's first year which were held up by dowel rods. I am blessed that she is not just my mom, but also my best friend. Although I'm tiring of repeating this story over and over, I'll continue with what's transpired since so I can set a baseline for what's happened over the last few weeks as I believe it will be important for me to continue writing during the months and years ahead as I continue throughout this experience. Furthermore, I know I will experience lots of personal growth and it might actually be interesting to look back at the unnecessary fears I had as well as in my ignorance of what's to come, the big things that I never even thought of. The week following Matthew's party, Dustin and I traveled to the Cleveland Clinic Main Campus to meet with a Pediatric Cardiologist who performed a Fetal Echocardiogram to make the "official" diagnosis of baby's heart defect. The high risk doctor had described the defect so well to me the previous week that I could see it as plain as day on the ultrasound monitor. Silent tears streamed down my face and I had to stop watching the monitor. 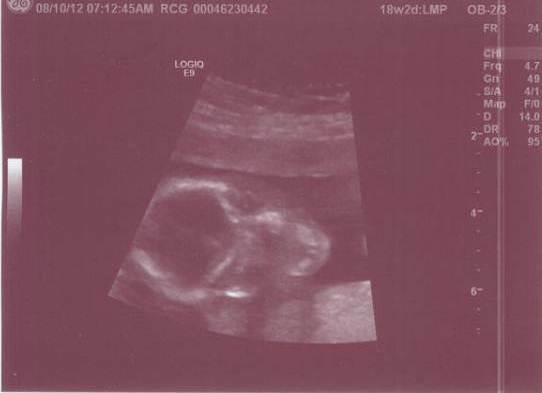 Never in my life would I have believed that I wouldn't be able to watch my unborn child during an ultrasound. 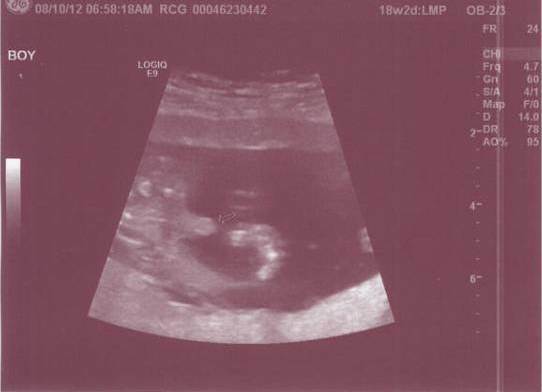 I had looked forward to every ultrasound I had ever had with Matthew and honestly I had looked forward to every one I had for this child up to that point. Life is such a miracle and to see your baby swimming around on the big screen... could there be anything more wonderful to an expecting mother? The doctor showed me how to change the channel on the TV and for the next hour I watched some stupid game show instead of my sweet baby. I feel guilty for that now, it was selfish of me to be so consumed with my own feelings when I should have been praising God that my child had already defeated the odds and eluded the high rate of miscarriage for babies with DS. 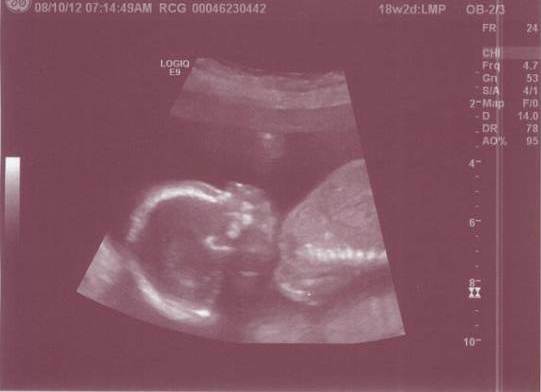 For him, making it to 20 weeks at that point was a feat in and of itself. Following the ultrasound, the doctor shared with us her confirmation that our baby had CAVC and we proceeded to discuss what lie ahead in our future... We'd be coming back at 26, 32 and 36 weeks to perform additional fetal echocardiograms as well as coming back to meet the surgeon who would be performing baby's open heart surgery and tour the Neonatal Intensive Care and Pediatric Intensive Care Units, also known as NICU and PICU departments. We continued our day with a trip to Cleveland Clinic's Hillcrest Campus where our high risk doctor was scheduled to perform an amniocentesis as we had decided we just wanted to know if the baby did or didn't have DS. Before we actually completed the amnio, the doctor shared an additional option with us, called the "Verifi" test, an experimental blood test that would isolate my DNA from baby's DNA and test his for the presence of an extra 21st chromosome - we elected this test over the amnio due to the amnio's slight risk of miscarriage. Dustin and I ended the day with a 3PM lunch at Cheesecake Factory before making the hour long trek home. While we'd each been dealing with the news on our own for a week, this was the first that we'd had a chance to spend the day together without Matthew, family, friends, etc. and although it had been emotional considering we'd spent it at two different hospitals learning of our baby's diagnosis, I believe there was also some healing for us that took place, especially during lunch. We actually had a chance to talk about what was happening and what we would be facing in the future and by the end of lunch, Dustin had me laughing. Although he can be impatient and often keeps his emotions tucked deep inside, he is also my rock - someone that listens (or at least pretends to), reassures me when I have doubts and is such a loyal best friend. He is also a wonderful father. Since then we've been in limbo waiting for the results from the DS test. We had hoped to get it two days ago during a regularly scheduled appointment with the high risk doctor, but the results weren't ready yet. Our doctor finally called this morning to let us know that "the results were consistent with Down Syndrome" although his delivery was much more compassionate than it sounds written down. Even though I had expected such news, I still cried when he told me. 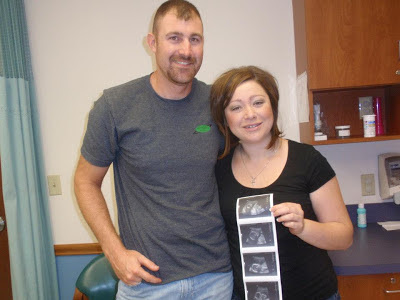 As I should have expected, when I called Dustin at work to share with him what I'd found out, he reminded me that we had been preparing for this result, encouraged me that we'd be okay and that we were still going to love our baby. All things that I had already known, but I have to admit they sounded very comforting coming from him at the exact moment I could feel my heart sinking. We are all gifts from God. We will love, protect, nurture and raise our children in a Christian home. God has been preparing us for this journey for quite some time... we have a good marriage, are blessed with wonderful friends and family, we attend an awesome church, we have an amazing babysitter, have good jobs and we have already gotten one child to 12 months. We can do it again and we have the confidence that we can even conquer the months and years following that first one for both of our children! This child is going to open us up to an entire world that we never even knew existed - a world filled with compassion, joy, a great sense of community and is likely going to make us reflect on our lives to help us make sure we are pleasing Christ through our thoughts and actions. We are going to meet new people and will likely be humbled day after day. As I sit here typing this, I can feel baby moving inside me - he is a miracle and will be such a blessing on so many levels. Matthew is loving and independent, curious and bright, funny and social and in general, he's basically perfect! In my heart I know that he is going to be the perfect big brother. He is persistent and patient, I could go on and on... I know that he is going to have so much love for his little brother. We know that our God is good. CVAC and DS are not the end of life for our family, but rather the beginning. I was sharing with a co-worker yesterday that all of this information has been like getting your fortune read. While I've never been to a fortune teller, these test results are kind of the same thing... they are both a blessing and a curse. It's wonderful to know about the heart defect so we can deliver at a hospital prepared to deal with baby's needs, but at the same time, we don't fully understand what all of this means - and it's likely that we won't understand until we've experienced it and who knows.... we may never understand. All we know is that we have to trust in God and his plan for us. Surgery is scheduled for May of 2014. It's hard to believe it will be here before we know it. I will be sure to post details as it gets closer. Believer in Christ. Mother. Wife. Daughter. Sister. Friend. Volunteer. Passionate. Driven. Caring. Conservative. Rural American. Friend of Agriculture. Student of Life. Reflective. Thoughtful. Loving. My name is Kristin and above are words I have chosen to describe myself. I am the mother of two boys, an intelligent, funny and selflessly loving toddler and of another little guy, a soon-to-be-born son who has been diagnosed with Down syndrome and a congenital heart defect known as Complete Atrioventricular Canal Defect (CAVC). Over the years I have learned that I can best process information, reflect on life and plan for the future when I write... perhaps this is a side effect of majoring in communications while in college or maybe it's just a silly ritual I've created for myself. Either way, it has become my version of escape during hardship, celebration following victory and simply put, a way to clear my thoughts and document my journey. Although I've kept a private journal for many years, after searching the internet for information on Down syndrome and CAVC, I've found that some of the best resources available are as informal and unscientific as other parents who write about their experiences. I know that God has given a purpose to my life and while I've lived believing that the service I've provided to others thus far in my short 30 years was fulfilling the purpose He had designed for me, I've recently been awakened to the fact that a new and curious chapter of my life is beginning to unfold. I am determined to find a way to use my life and experiences as a blessing for others and as I begin to dig out of the emotional chaos that has consumed me for the last few weeks, I know that I will emerge stronger and more focused than ever. Not discounting the necessity to learn from doctors, specialists and the science that supports them, but I'm considering this new chapter to be my effort in helping other parents who may find themselves in my shoes and are beginning to make sense of their circumstances. In my heart I know that God has chosen me to love and nurture the little blessings that He's bestowed upon us and that he has and will continue to offer me the strength to forge ahead and advocate for my family in the months and years to come. We learned today that baby # 2 is a boy! Dustin and I holding his first string of photos! 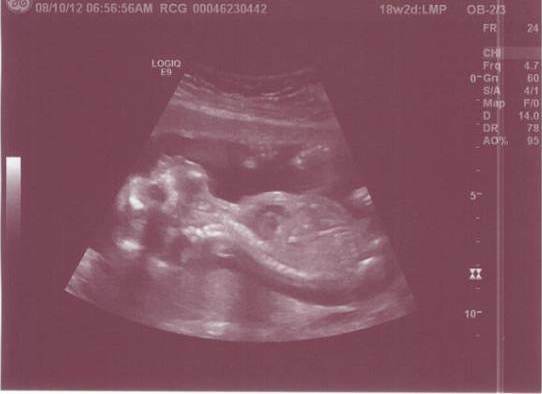 Here are some close ups of his photos from today, our 18 week anatomy ultrasound.